"Anybody who ever built an empire, or changed the world, sat where you are now. And it's *because* they sat there that they were able to do it." Says Ryan Bingham as he is firing the person in that chair. 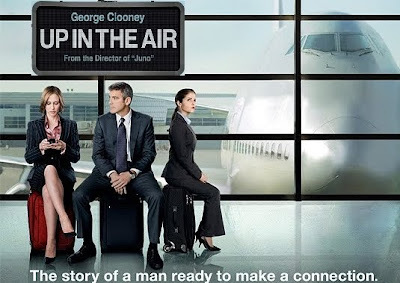 Adapted from the Walter Kim novel of the same name, Up In The Air follows the life of Ryan Bingham (Clooney), a man that makes his living travelling from city to city around the country firing employees for bosses that don't have the balls to do it themselves. He actually works at a company that specialises in this kind of stuff. Ryan looks like a bit of a loner, but he wants it that way. Spending a large chunk of the year on the road where his goal is to earn 10 million frequent flyer miles, thats where he feels at home, not back in Omaha. So satisfied with the way he lives, he also does motivational speeches titled "What's in your backpack" where he tries to sell the idea of freeing yourself from all your hang ups, material things and relationships with others. Basically trying to sell his type of lifestyle to others. While on the road, he meets another frequent flyer, Alex (Farmiga), and starts a casual relationship. Called back to the office in Omaha, Ryan meets a young coworker named Natalie Keener (Kendrick) that proposes a system to fire employees with an online video conferencing tool. A change in business strategy that effectively grounds him. Trying to talk his boss (Jason Bateman) out of going down this path, Ryan and Natalie get sent on the road together so she can experience the layoff process first hand. During their travels, the two of them meet up with Alex a few times which proceeds to them developing possibly something more than a casual relationship. Up to this point, I didn't think it was too bad a movie but it kind of lost the originality in it that the first half of the movie had. From here on it turned into another romance story. Directed by Jason Reitman, (Thankyou For Smoking and Juno), he claimed to have written the parts for the main characters and a few of the supporting roles specifically for them. Even the cameo by The Hangover's Zach Galifianakis. True or not, everyone put forward good performances, portraying their characters well. George Clooney especially. I'd rate this as one of his best performances in film along with his 2007 drama, Michael Clayton. Although it got nominated for 6 Oscars, I didn't love it, but I didn't mind watching it. At 109 minutes long, it's a good length for this type of film. I can see plenty of people enjoying it. Just watched most of the movie. Good snippets of believable dialogue between characters and interesting perspective of what's important in life. I felt the movie got better again towards the end.